States have been ditching the Smarter Balanced Assessment (SBA) for a few years now. Public backlash has caused some governors to reassess whether they should be using the highly controversial assessments in their public schools. In NH, Governor Hassan and the bureaucrats at the DoE still can’t admit the SBA was a huge mistake on their part but since parents are refusing to let their kids take it, they are finding other ways to force compliance. The latest assessment scheme they came up with is the PACE assessments. PACE assessments are in a few pilot schools throughout New Hampshire. Parents are starting to realize that even though they were told there’d be less testing with PACE, that simply isn’t true. This entry was posted in Data Mining, Testing and tagged AlissaSouza, PACE, Rochester on May 10, 2016 by SCC. NH School Districts in Violation of State Law and Ethical Codes when Testing Students? This letter was sent by the Londonderry Superintendent to parents recently. As we read through it we noticed a great deal of information that was left out. Why are Superintendents not fully informing parents in the district about the possible violation of state law and ethics codes? Parents are encouraged to contact their local attorneys if they believe their rights have been violated. Below, please find a link to a letter introducing this year’s administration of the Smarter Balanced Assessment Consortium test, to the attention of parents and guardians of all students in Grades 3-8. Included with this letter, you will find a page of ‘Frequently Asked Questions” to clarify several misconceptions regarding this test. Scheduling details will be determined by each school, and further information will be forthcoming. Testing begins for Grades 3 & 4 on March 16, with the other grades to follow. Thank you for the information on the Smarter Balanced Assessment At this time I’m writing you to inform you that my child……..will not be taking the Smarter Balanced Assessment. It appears the letter you sent is meeting this new requirement however within your letter you made the assertion that if the school district does not meet the 95% participation rate, “possible consequences could range from a negative designation on our report to the loss of federal funds for the District.” One of the possibilities could be that nothing happens however you didn’t mention that in your letter. For instance, there were assumptions that schools who did not meet the 95% participation rate last year could face the loss of federal funding. There were schools in New Hampshire that did not meet the 95% participation rate yet I’m not aware of any state or school losing federal funds. New Hampshire State Law: RSA 193-C, requires statewide assessments to be valid, appropriate and objectively scored. http://www.gencourt.state.nh.us/rsa/html/XV/193-C/193-C-mrg.htm Can you provide “INDEPENDENT” validity studies on the Smarter Balanced Assessment that shows it is in compliance with state law? According to this letter http://www.fosters.com/article/20150407/NEWS/150409532 from Jayson Seamon, Phd Education Researcher, the Smarter Balanced Assessment has not been validated. 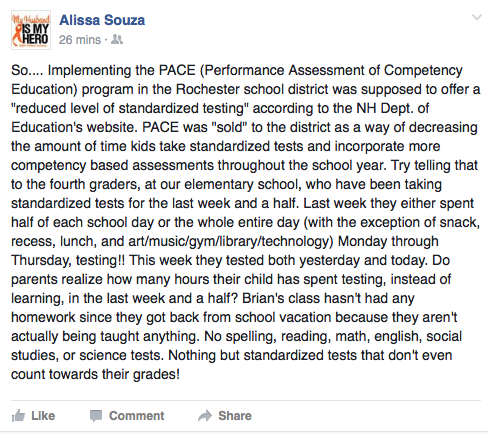 If this is true, wouldn’t administering the Smarter Balanced Assessment violate state law? It appears as if you are sending “notification” to parents but you are not asking for informed consent. What ethical practices are you following when you administer these assessments? It appears as if the district is in violation of state law by administering an assessment that hasn’t been independently validated. It also appears as if the district is not following basic ethics rules that require consent from parents. Notification is not informed consent. (a) Psychologists obtain informed consent for assessments, evaluations or diagnostic services, as described in Standard 3.10…. Will the district provide parents a description on the strengths and limitations of the test results and interpretation? Why is the district not seeking informed consent from parents prior to administering these assessments? I am copying the school board so they are informed and can act appropriately. My request to the school board members is to first address the possible violation of state law and then the lack of ethical standards when administering the Smarter Balanced Assessment. Would administering this assessment put the district in a position where parents can sue the district for administering an assessment that violates state statute ? What are the ethical codes the district should be following when administering a psychometric assessment? As a parent and taxpayer in Londonderry, we should be protecting the students by upholding the highest ethical standards when administering these types of assessments. The letter you sent to parents left important and critical details out. It seems to me that if the district is going to move ahead with administering the Smarter Balanced Assessment, or any other psychometric assessment that has not been independently validated, more information should be provided to parents so they can make informed decisions for their children. I ask the school board to review this information and look to developing policies that protect the interest of the students they are serving in the district. HILLARY CLINTON admits NH Dept. of Ed is Breaking State Law? This entry was posted in Smarter Balance, Testing and tagged Londonderry, SBAC, SmarterBalancedAssessment, valid on February 18, 2016 by SCC. We’ve been trying to warn everyone that the assessments used in our public schools are in violation of state statute. New Hampshire Families for Education has blown the whistle on this but it seems no one is listening. State statue says that assessments must be “valid” and yet the NH Dept. of Education has never made available independent validity studies. The NH Dept. of Education is also involved in new PACE assessments that will replace the Smarter Balanced Assessment. Where are the independent validity studies? Hillary Clinton while campaigning in New Hampshire a few weeks ago stopped to talk to a New Hampshire parent who brought this to her. Even Hillary Clinton admits the Common Core assessments are not valid assessments. “I asked her if she was aware that the current [Common Core-aligned] tests are not even validated, and she replied, ‘yes,’” Lawless said. When will someone hold the New Hampshire Department of Education and schools across New Hampshire accountable for breaking state law and using unethical and invalid research? PARENTS: It’s almost time for schools to start administering the standardized assessments. This is a good time to NOTIFY your local school if you want to REFUSE to let your children take these assessments. This entry was posted in Smarter Balance, Testing and tagged HillaryClinton, invalid, PACE, SBAC, valid on February 16, 2016 by SCC. The fatally flawed Smarter Balanced Assessments didn’t even hit your child’s desk before the New Hampshire Department of Education was pushing for a different assessment for your children. The new experiment on your children is called the PACE assessment. The PACE assessments will replace the Smarter Balanced Assessment in some of the elementary grades but maintain the emphasis on testing the non-academic dumbed down workforce skills and Common Core standards. But does PACE offer parents information on whether their child knows Math or English? We know that the Smarter Balanced math assessment was fatally flawed. If we are going to replace one bad assessment with another assessment, shouldn’t we be assured that this one will not have the same baggage as the last one? At least parents could refuse to let their children take the Smarter Balanced Assessment. With the PACE assessments, and under the Competency Based Model, students do not move forward unless they pass their competencies. Will your child be able to move forward if you refuse the PACE assessment? Or is this a way to FORCE your compliance? Will the NH Dept. of Ed. acknowledge a parent’s right to refuse but then deny a student the ability to move forward in their class if they do not take the PACE assessments? To make matters worse, we are finding examples of other states using other “Common Core” assessments that parents are finding, reduce their ability to learn the actual academic content and thereby minimize their chance of acquiring the knowledge to move into engineering careers. Common Core is what the New Hampshire Board of Education adopted in 2010. The Smarter Balanced Assessment, the new SAT and the PACE assessments are all based on the Common Core standards. If the testing of the standards are fundamentally flawed, at least with the Smarter Balanced and the SAT, parents could refuse. Unfortunately the Common Core curriculum and instruction will still deny them a quality math education, but parents could avoid the flawed tests. With the PACE assessment SCHEME, there seems to be a real effort on the part of the NH Dept. of Ed along with the schools that are going to adopt PACE, to FORCE YOUR COMPLIANCE. What can parents do? Go to their local board meetings and tell them you do NOT want PACE in your district. With Smarter Balanced and the SAT’s you get to decide whether or not you want your child to take those assessments. Ask professionals in your local communities to start analyzing the standards and assessments in your schools. In Texas, two fathers who happen to be Engineers took time to look at the Common Core assessments and share the problems they found with the State Board of Education. Demand to see all of the testing materials in your school and given to your children. You have a right to see these materials. If you do not identify the problems in your child’s education now, it may be too late when they get to high school and begin looking at colleges. We know that the Common Core Standards do not prepare children for college programs in the Science, Technology, Engineering and Mathematics (STEM) field. It’s up to parents to let their school boards and elected representatives know that you expect better from them. These kind of psychometric assessments do not measure academic knowledge. They are there to measure your child’s attitudes, dispositions, values, etc. Parents are now starting to discover that they don’t want any part of this kind of testing on their children. They simply want to know if their child can answer basic math questions. PACE will be used as a tool to force compliance to this kind of testing so while they “experiment” on your child, it’s up to you to make sure your board knows you want NO part of this kind testing. This entry was posted in Testing and tagged Dads, PACE, Texas on January 30, 2016 by SCC. Will Your School Break NH Law? Why so much secrecy in TESTING? We encouraged parents to request the questions and answers on the Smarter Balanced Assessment (SBA) their children took last spring. While many refused to take the SBA, those who took it have the right to look at every question and answer their child was given per New Hampshire law. Unfortunately we are starting to hear that this information is not being provided to them by their local schools. Why not? In Massachusetts, parents could see all of the questions and answers on the old MCAS. Why all of the secrecy? Smarter Balanced assessment results were released by the NH Department of Education on November 12, 2015. If you are denied this information that is a — violation of state law, RSA 193-C:10. For the most part these assessments were administered online, so districts no longer have any assessment materials on hand. Districts are blaming this violation of parental rights on the Smarter Balanced consortia which has not released individual assessment questions. Why would any district administer a statewide assessment without being able to provide transparency and accountability to parents — which is required by state law? Why would the state mandate a statewide assessment that provides parents with no transparency or accountability — which is required by state law? Your Superintendents should have made your school boards aware of all of this! 193-C:10 Accessibility of Assessment Materials. – After the assessment results are released by the department, a pupil’s parent or legal guardian shall have the right to inspect and review the pupil’s assessment, including the questions asked, the pupil’s answers, instructions or directions to the pupil, and other supplementary materials related or used to administer the pupil’s assessment. A parent or legal guardian shall direct a request for inspection or review to the pupil’s school, and the school shall comply with such request within 45 days of its receipt. The department of education shall make available released assessment items on the department’s website as soon as possible after the statewide assessment results are released. The commissioner shall adopt rules, pursuant to RSA 541-A, to implement procedures for the review and inspection of assessment materials. These rules shall provide parents and legal guardians with no fewer rights accorded to them under the Family Educational and Privacy Rights Act, 20 U.S.C. 1232g. Source. 1998, 290:1, eff. Jan. 1, 1999. 2014, 219:1, eff. Sept. 12, 2014. This entry was posted in Smarter Balance, Testing and tagged SBA, SmarterBalancedAssessment, Transparency on November 30, 2015 by SCC.